The HPSO Quarterly magazine is published every three months (Winter, Spring, Summer, and Fall) and contains information about events and news of the Society. 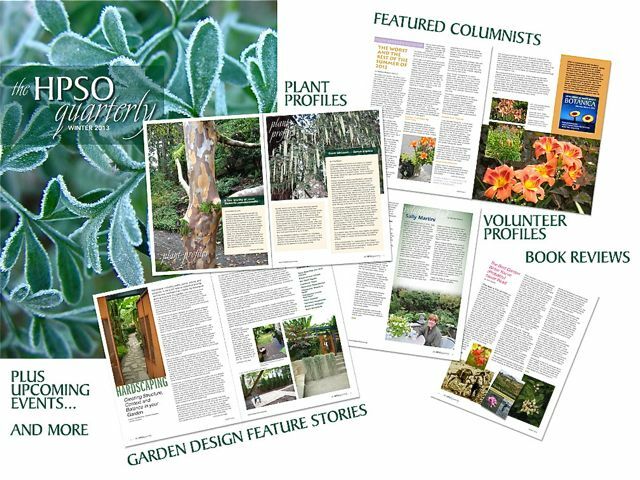 It also contains articles written by members on horticultural topics, such as favorite plants, visits to gardens, and reviews of gardening books. All members are invited to submit articles; almost all are published, so it's a great way to see your name in print! HPSO actually has members on the other side of the country who maintain their memberships just so that they can receive our HPSO Quarterly magazine! A full-color version of the HPSO Quarterly is available to members by email or online. A printed, full-color edition is also available by US mail for a small supplemental membership charge to cover the printing and postage expense. Members have online access to the current issue of the Quarterly, plus all of our archived editions. Use the Member Login button above for access.